I’ll be honest – I’m not quite sure I ever expected to hear a decent choir again. My apologies to all those out there involved with boys productions, but I just find the modern choirs to be intense, sharp and somewhat obnoxious. Them’s fightin’ words, I know; but pray tell me – where can one find the simple beauty of the old Tzlil V’zemer and London School types? I don’t know if Yossi Green set out to rectify that, but he did. I was taken by the very first song on the album, by the sincerity of the vocalists, and by the magnificent production. A well-struck balance of modern and classic tones is placed, giving rise to what I believe will be a classic in the choir genre, taking its place among classics like TzV’Z’s Vol. 2 (Aibershter) and London’s Return. Hiskabtzi: ***** You don’t often find songs layered this well. The song begins simply enough, but by the time the choir enters the scene – crisp and clean, strong but not over-powering – the beat changes ever so slightly, almost forcing your head along with syncopation. The soloists are strong and mature throughout, and the production wisely and intriguingly stuck to the one soloist. The harmonies are unique, fun, and fairly complex, while singable. The song fades out in a gorgeous move at 3:00, slowly adding in more pieces until an explosion of orchestration and syncopation at 3:40. Well, well, played, my friends. Ata Kudosh: ***** Just so you know, lightning didn’t strike once here. That all around solidity follows into the next piece, a reflective melody that begins with a heavier sax/guitar than might be expected. Nevertheless, keeping you on your toes, the music falls behind with a hypnotic piano that leads to the plaintive solo. They set the soloist up for a high note, but he reaches it without struggling, and neither does the choir on the high crossover. The abrupt end there is another great insertion – why should anything be standard, if you can work it out? The bridge gives spiritual oomph to the song; reaching to a very authentic Poilisher Chassidic feel, and tossing those early keys inside for depth of color. And Green’s vocals mesh beautifully with the boys throughout – alongside some stellar syncopative choral work at about 5:00. Ein Keloikeini: **** A funky beginning with keys, electronica and some pizzicato is completely unexpected. But the song is very familiar yet, with a very classic Jewish song amidst the very creative specter created by Naftali Schnitzler. Man, is that guy on a roll. Glad they had the soloist lower in the mix, as he’s reaching for heights, just nudging his level of strain. Ribonoi Shel Olam: **** Another beautiful song, utilizing the gorgeous words we say every morning in Korbanos. This soloist has a younger voice, but a mature usage is indicative of an excellent choir leadership – he remains sweet all the way through, avoiding the pitfalls of nasal or other somewhat atonal strain. 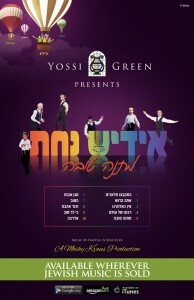 Yossi runs through his paces with a light, whispery voice, and the choir meets him there towards the end of the song. Matana Tova: *** A pretty piano crashes headlong into a trance keyboard, but the foundation of the song is classic Yossi Green. The arrangements here rely mostly on the heavy drum and rhythm guitar, with a bit of keyboards, and the choir doesn’t have any real chidushim, so it doesn’t quite match up to the earlier pieces. But it’s a decent song in any case. Mogain Avos: ** A Friday night chazonus begins this waltz, the least favorite of mine on the album. Firstly, in the opening notes, the soloist strains way up high numerous times through some very difficult notes. And considering that is almost half the tune right there, well, it’s just too bad. And nothing in the rest of the fairly standard number makes up for it. And then to head him back up high for the end of the song? Why? Hatov: *** A very typical tune, reminiscent of Jewish music back in the late ‘80’s, early ‘90’s. But it’s got an exciting arrangement to it. As with the previous song, a mite high for our soloist. Zechoir Ahavas: *** A pretty melody, full but not spectacular arrangement. And again a high ending pushes the envelope a bit. Ki Lecho: ***** Brilliance. Cool effects from the way beginning color this snappy tune. The heavy dance beat makes this upbeat niggun-like tune that much more exciting. And in a welcome return to the beginning of the album, the choir’s harmonies are just truly entertaining. 2:23 ushers in a salsa trumpet, which is traded for some Tish-type clapping and singing at 2:44. Awesome backing harmonies end the piece, as the choir goes up the octaves in the background one by one. Great job! Aderaba: **** This classic Green composition and Fried classic gets a gorgeous update. The soloist sails the piece like a pro, smooth and emphatic, with every k’neitch placed perfectly. And the choir matches him note for note with top notch backing, amid a perfect arrangement. More than solid – as stated earlier, I think this album will remain a classic choir album for a very long time. It sets high standards for compositions, arrangements, choral direction, harmonies and soloists. A fantastic album. Amazing about this album is an understatememt. Truly worth every penny to buy. Quite refreshing. Also, very few albums have what it takes to get you to love it more the more you listen to it. I’m gonna have to disagree with you on your line about choirs. Miami is still on top of their game and still the best. We’re obviously on different pages here, but I’ll take the opportunity to clarify my view: Children’s voices can be used in a variety of ways. It seems that many modern choirs have focused on expressing power and range over youth and expression. I’ll take the latter over the former any day, for these reasons: A) Sound quality – the kids often resort to nasal singing over chest singing. B) Emotion: Going up the octaves to the verge of screaming doesn’t make a song any better, and in fact loses the innocent quality that the best children’s choirs portray. C) Personality: It’s very rare to have a Meydad Tasa or Zohar who masters vocal range and expression at a young age. It seems that some choirs try to force that out of kids, and to me, it sometimes comes across as obnoxious. These are all balances that choir directors need to walk, and some do it better than others. Hearya; but you must agree that Miami does not do much of the nasal and screaming at all..